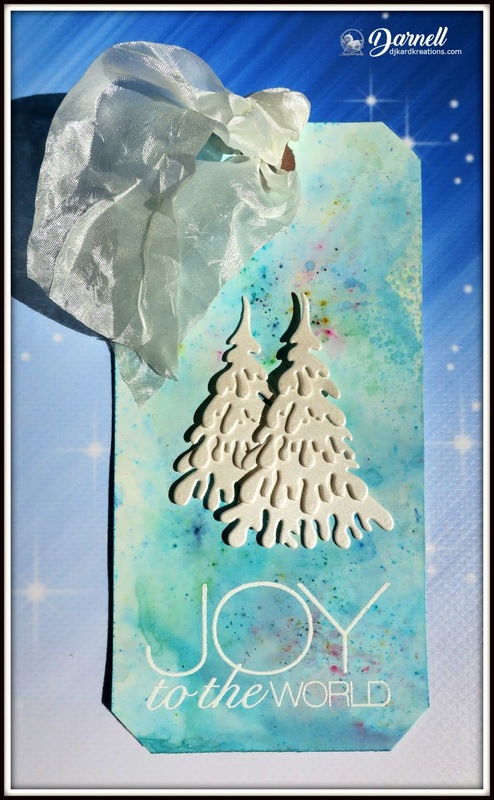 djkardkreations: 2018 Twelve Tags of Christmas With Loll and Friends! 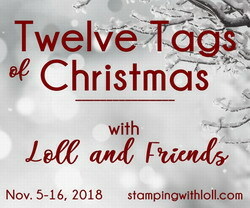 2018 Twelve Tags of Christmas With Loll and Friends! I hope this finds you enjoying the week! Yesterday was Veteran's Day: a wonderful day to reflect and thank all the men and women who have served the country during times of war and peace and to thank their families for all the sacrifices they have made. Thank you! 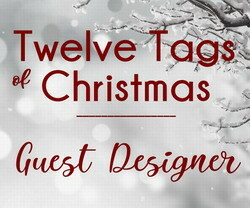 Today is my day to appear as a Guest Designer for my friend Lolly's inspiring annual Christmas tag event: Twelve Tags of Christmas With Loll and Friends. This will be the final year and I want to thank Lolly for putting this event together every year for five years! I have found lots of beautiful tag inspiration in the galleries over the years! I actually made the tag background in May at our Vancouver retreat. Christine is lucky enough to live near a paper factory and we all reaped the benefits of that! There were a lot of tags for us to play with and we decided to slap them around in some spritzed Lindy Magicals. We were very pleased at how beautifully the non-watercolor paper tags soaked up the powdered ink! To make my tag, I added two whimsical die-cut Christmas trees made from a "Small Snow Covered Tree" die by Dee's Distinctively Dies. I had to buy this die as soon as I saw it last summer on Bonnie's blog. I cut the trees from a schparkly snowy paper, but you'll have to take my word for that. Hammy inserted a foam dot between the layers to give them some dementia. The white heat-embossed Christmas sediment is from PTI and the shimmery fluffy bow is from a roll I've had since the twins were babies. Thank you, Lolly, for having me as one of your Guest Designers. It's been fun! 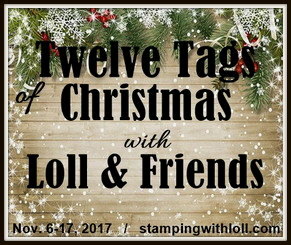 I hope you'll be able to join in the Twelve Tags of Christmas With Loll and Friends! There are prizes! Below is a recap of all the information you need! Inspiration Tags posted Nov. 5 - 16. Linky open for entries Nov. 5 - 23. Top Tags posted Nov. 30. Include a link to Twelve Tags challenge in your write-up. 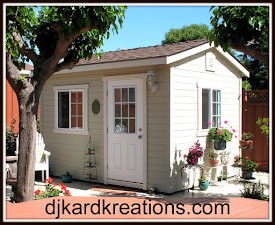 Add your entry with the linky tool on Loll's blog. Enter as many times as you'd like, new entries only please. Winning Tag - $50 Gift Certificate for Simon Says Stamp. It was a pleasure bringing you a cold and icy tag today to take my mind off the fact that so much of California is burning again. All these years of drought are really being felt as over 117,000 acres have burned in this latest fire which is only 30% contained. Over 7,000 structures have gone up in flames, most of them homes. An entire town of 26,000 people is in ashes. To date, 42 people have died, and over 200 are still missing. It's beyond sad, but it's also a miracle more people didn't die as the fire was traveling the length of a football field every three seconds! Horrifying! Thank you to all the brave firefighters who are putting their lives on the line to save as many homes and as much property as they can. We pray for their safety as they work 24-hour shifts. Many of them have lost their own homes, but they work on, trying to save the homes of others. We are five days into it and the smoke is still at an unhealthy level throughout the Bay Area (where we are), which is 180 miles away from the center of the inferno! And there are two other deadly fires currently raging near Los Angeles. It is all very scary and it reminds us once again how life can change in an instant. It reminds me to tell you how much I appreciate you! Mwah! Darn, girl, your tag is gorgeous...wish I could see all the sparkle but technology hasn't yet caught up to us crafters. I know you must be suffering through this lousy air just as we are but our suffering in no way compares to the losses these fire victims have felt. It brings tears to my eyes all the time when I think of them and our brave, diligent firefighters. 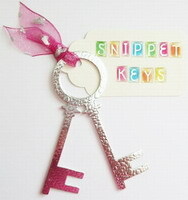 Beautiful tag with the shimmery and soft colours of the magical background, Dolly. Christine's huge supply of tags such came in handy! Love the sparkle of your glitter trees. Thanks again for being a Guest Designer at TTOC!! Such a beautiful and pretty background and those trees look fabulous. Well done you on using up that pretty ribbon, which you've been hoarding. Wonderful tag Darnell and absolutely gorgeous X. Your tag is gorgeous, Darnell. Love those trees and the wonderful background you created with those tags. The colors you chose are just beautiful. Praying for your safety. The fires are scary indeed. I have family in Los Angeles. I've been praying. Beautiful tag. Love that die. I can see why you were enabled by Bonnie. Hi Darnell, yes the fires are horrifying, so much devastation and loss of life, so sorry for the people concerned. Such a pretty wintry tag Darnell. The background looks fab and I love the die cut tree. Hats off to Hammy for adding the dimension. Your frosty tag is gorgeous, I love the background and the aparkly trees are so pretty! I love the ribbon at the top too! A really fabulous tag Darnell, gorgeous background and lovely trees. Dreadful isn't it, those poor people and the firefighters must be exhausted. Dear Darnell, I was thinking so much on you in past days when I heard about fires in California. I was fascinated about your country since I visited some parts of it. It hurts to see photos and videos and read about the suffering of firemen and people who are living there. I am sorry about the dead of so many people. My thougts are with all of people in California. I wish that inferno ends. Your tag is just delicious, that background is awesome behind the sweet snowy trees! I see the shimmer on those luscious, snow covered trees, Darnell ... and can imagine all the glimmer from the magicals (as I have a page here to play with!) ... and they're gorgeous together! The ribbon is like a layer of delicate frost about to descend on the trees ... a perfect addition to this dimensional delight! Your tag is so pretty Darnell! The slapped and spattered background is truly magical. The tree die is pretty darn cute too! I'm so glad you're safe from the wildfires. Our son and D-i-l are in central CA, and hopefully far enough away. These fires break my heart for all those affected and I've certainly been saying my share of prayers for everyone. We're headed in their direction soon to spend Thanksgiving with them. I hope you stay safe and have a happy and blessed Thanksgiving! Wow those lindy's magicals certainly give a lot of shimmer floating around the surface. The blues with your icy tree are a perfect match. Such horrible fires, We are all thinking about you and hope you keep safe and well. Beautiful tag! I love the trees with their dimension! So pretty! I am in northern CA not too far from the Paradise, and my daughter is in Chico. A couple of my relatives who lived in Paradise have lost their homes. Thankfully, they managed to evacuate and are doing OK. I'm so glad you are safe but heartbroken for the many thousands who aren't. We're hearing some incredible tales of heroism though. And then there's the politics of it *cough* - thank goodness we are crafters and not here to talk politics! Your tag is utterly gorgeous, all it needs is a bit of schparkle and maybe one day somebody will invent a screen that actually lets us see it! Wonderful post Darnell and a delightful tag! 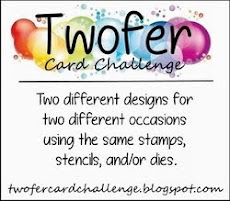 I didn't know this was Loll's last tag challenge : ( I missed it again! sigh but I surely have been enjoying all the tags in blogland of late. I have been watching the horrific pictures of the fires on the news Darnell and thinking of you and your family. The loss of life and homes is so tragic and to think that you are being affected by the smoke 180 miles away with no sign of the end of it yet is just awful. Stay safe my friend. On a lighter note, you tag is just gorgeous and I love that lovely ribbon which finishes it off beautifully. Lovely tag Darnell! I do hope the fires abate soon and they don’t affect you. Oh golly, Darnell, your tag is just so lovely. Sounds like you had a marvelous time creating that beautiful background. My heart is breaking over those fires. The ones in southern California are hitting a little too close to home as I grew up in the San Fernando Valley. The Santa Ana wind conditions are absolutely terrifying. I'm so sad for those who have lost so much and for those firefighters who are risking their lives. I hope they can get good control of the fires soon and that the air quality can improve for you all. Hugs! Your tag is absolutely BEAUTIFUL Darnell and I can just imagine how shimmery it is from the Magicals on your background and then the spharkly paper you used for that delightful little tree! LOVE the font of your sentiment too!! Lovely, lovely tag my friend! The fires just make me want to cry when I watch the news...so much devastation for your state these past few years! Take care of yourself and we will all continue to lift your state up in prayer for ALL the loss you've endured! I would love to live next to a Paper Mill... though they do get pretty stinky, if they had an outlet, I'd get beyond that! A beautiful tag, my friend - congrats on that GD spot! A gorgeous tag - just love the soft background reminds me of snow falling. I'm so sorry to hear about the fires in CA and am so glad that you are safe. all those poor people it's just heartbreaking. Your die cut trees are so pretty too with your pretty ribbon. TFS my friend. All the devastating fires are beyond imaginable and so tragic with the loss of lives and homes. I hope your air quality improves soon and thankful you are safe. Prayers to all those effected by the fires and to the hero fire fighters and 1st responders. Your slapped and magical background is gorgeous on this, Darnell! I've loved those tree dies since they were released, but were out of stock so often I gave up. They look very fun! Tags are a good chance to use some of that oldie ribbon that's loitering around your stamp room. It's altogether a beautiful result! Those fires... I can't remember the last time I actually cried when watching the news, but this is doing it. I know the smoke must be awful for you. We even had a little of it here yesterday, but only a very little bit. So glad you found a great use for one of the tags from our retreat! Love the two little trees and the shimmery fluffy bow! I've been watching the news on the horrific fires in California - so heart-breaking for so many people. Take care of yourself as you cope with the unhealthy levels of smoke. I know what that's like as we've had it in Vancouver the last two summers from the forest fires in the interior of the province. Gorgeous background for those wonderful trees, Darnell! Love the sentiment done in white! What a beautifully elegant shimmery tag, love it Darnell! My goodness your tag is gorgeous!! Love the background and the sparkly trees!! Can’t imagine being sonnear fires of that magnitude. Sending many prayers for all the first responders and all the residents. Hugs! Congrats on your GD spot Darnell! Your tag is wonderful! Lovely BG for those trees. ... and oh I love it!!! Esp love the joy to world stamp might need to check that out... sigh maybe not.. want not need! The shimmery shades and simple design enhance it wonderfully. Shock horror I joined it too. I hardly ever have done a tag! PS meant to say also as fires are so horrid at times here in Oz and some Californian firefighters have come to help here in past years I’ve prayed for mercy. We haven’t heard a lot but then maybe because I’m on a tv ban to try to catch .. praying for comfort mercy and help. It goes on for so long afterwards too. My friend I stayed with in Sept in Nth Florida is still with her roof not sound just tarps on it from Hurricane Michael and wont be done for three more weeks she’s been told. But glad to be back home again, was with her son for weeks while it was made habitable. Gorgeous background for those sparkly trees, Darnell! Thinking of you & all the Californians who are suffering with the fires!! Your tag is so pretty with that little tree and I love the blue color. As for the fires, it's good to know you're relatively safe for now, but as you said - that can change in an instant. Watching so many homes and dreams go up in smoke is just heartbreaking to watch and the sadness is overwhelming. Please take care and stay safe and hopefully this will soon be over and people can start rebuilding their lives once again. Sending hugs your way. p.s. I didn't know that you live in CA. I'm a Californian (LA) too. I'm sorry for the unhealthy smoke up there. Stay inside and be safe. Your tag is gorgeous with the wonderful textured trees! Take care. T.
Stunning winter scene on your tag! Love the background and your snow covered trees! I can see why you had to get this die... We had our first snow storm today and the trees outside look like the ones on your tag! The fires in California are horrendous and it's hard to imagine how these people have suddenly lost everything! Fabulous tag! Love the result of all the spritzing even if I'm still to scared to use those powdery things. A magical tag Darnell, lovely soft background for your gorgeous trees and sentiment. Hope by now those horror fires are under control, very scary. Wow! I love how pigments soaked in paper giving such a different effect than on watercolor paper. I love your beautiful Christmas trees, they are so cute. A great tag, Darnell, beautiful inspiration!